The perfect yard should always have privacy in mind. After all, if your goal is to spend lots of quality time outdoors with your friends and family, the last thing you want to worry about are nosy neighbors getting into your business. And, if you have children, private yards can provide some peace of mind when our kids are playing outside. We want to be able to let our kids play in a safe place, away from the eyes of strangers. Hedges are the perfect solution for creating a secure and private play area for everyone in your family! We know that no two landscapes are the same. Some properties have huge backyards. Some yards are much tighter. There is a solution no matter what size yard we are working with. Hedges such as Indian Laurel Columns and Italian Cypress are perfect for planting in tighter spaces and creating privacy. Block that unsightly view with something beautiful – plant hedges! Planting hedges around a property line does more than create a private area. That’s right. Hedges can also create some of that cool and comfortable shade we need during our blistering hot sunny days of summer! And, guess what? When hedges are installed properly around your home, they can help lower the temperatures inside your home. Lower the heat in your house, reduce energy use and save money! When it comes to hedges, shade and privacy are definitely high on the list of attributes. That said, hedges are also highly effective windbreaks. 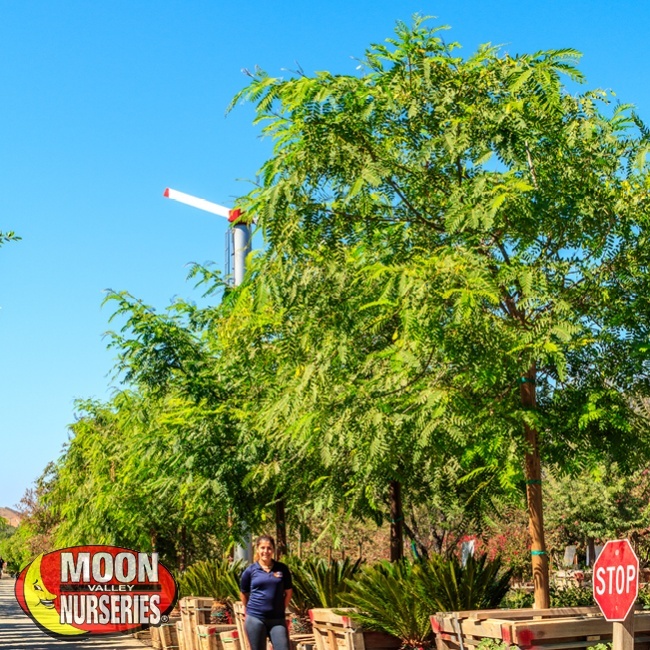 Also, if your property is next to a busy road, our fully-grown hedge specimens can help reduce sound from the street, and may even block that bright street light that keeps you up at night. Our Top Hedges for Arizona Yards! To take full advantage of hedges, we recommend buying them as big as you can. At Moon Valley Nurseries, we are your privacy hedgequarters! 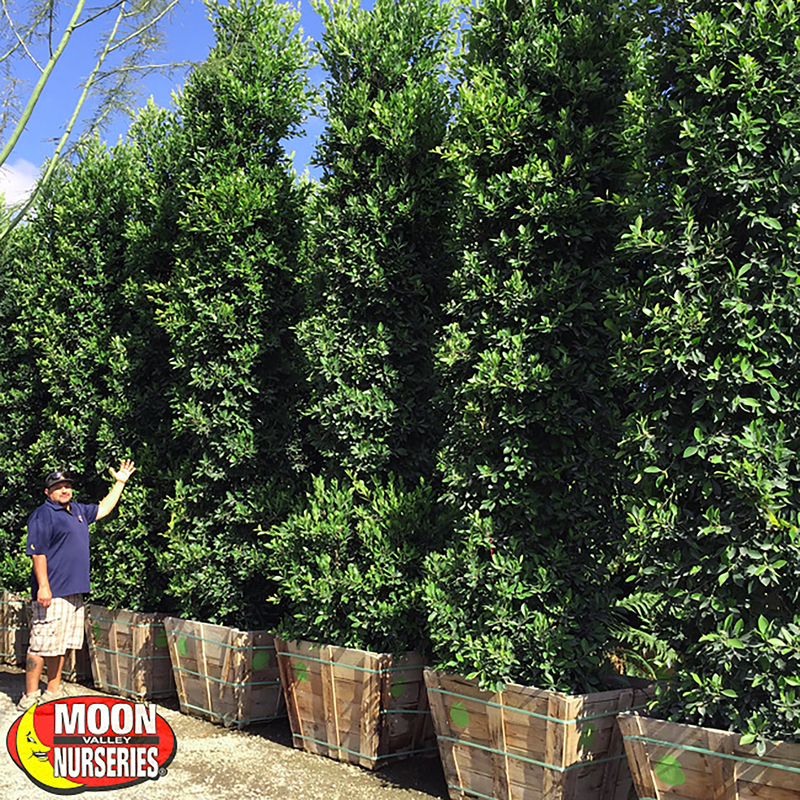 We have the largest and nicest-looking hedge specimens that you will find anywhere, ready to create privacy, shade, beauty, and much more! Indian Laurel Columns (Ficus nitida columns): One of the best hedges you will find anywhere is our Indian Laurel Columns. We like to plant them to create a living wall of privacy. These evergreen beauties can create an instantly private landscape and are the ideal choice to create a perfect yard. They thrive in desert environments and are water-wise, so they are well-suited for Arizona landscapes. As a bonus, homeowners love them for the massive amount of shade that they can add! Go ahead and enjoy some time in your backyard. Relax, unwind, or have fun, and do it in the shade, without nosy neighbors getting into your business. Plant these Ficus nitida columns in your yard and take in the dense green foliage that adds a splash of color to our arid environment. 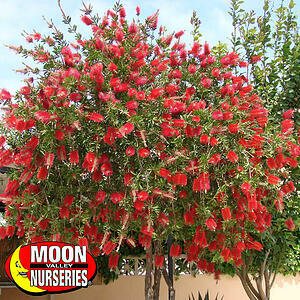 Bottlebrush (Callistemon citrinus): Plant this evergreen in your yard and create a colorful privacy screen! The Bottlebrush features showy blood-red bottlebrush-like flower spikes that can paint your yard in hues of red! The red blends in beautifully with the blue-green foliage. Line them up along a property line to create a living wall brimming with color. Hummingbirds are attracted to the fragrant flowers, so kick back and enjoy the spectacle of birds humming in your private yard. Oleander (Nerium oleander): Arizona homeowners know that they can count on this colorful, fast-growing hedge to create privacy. Summertime yards are more exciting thanks to the blooms of white, red, and pink flowers that occur until fall. 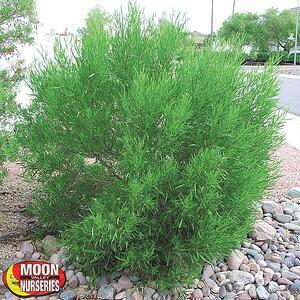 They are drought-tolerant, so they are ideal for any water-wise landscape. Beautiful flowers and dark-green, leathery leaves make this a top choice for use as a living privacy fence. We like to plant them so that they can block unwanted views in style! 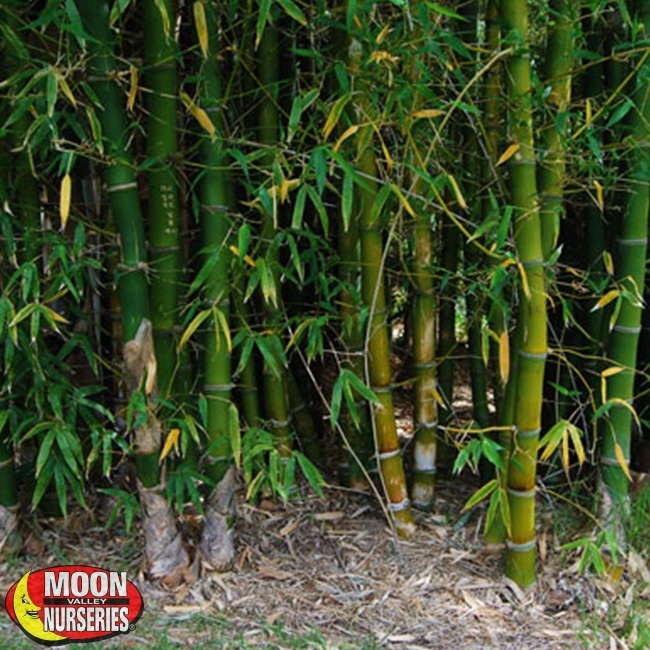 Golden Bamboo (Phyllostachys aurea): Golden Bamboo is a must-have in any Zen garden. Also, in your personal Zen garden, you are going to want to eliminate any unsightly visual distractions to keep yourself at peace and one with nature. Bright yellow stalks and lush green leaves grow together to further enhance the feeling of a tropical Zen garden, complete with privacy. It's easy to create a living wall for privacy when planting Golden Bamboo. These plants grow fast in a clustered growth pattern that creates a barrier in no time at all. Function meets beauty! Hopseed (Dodonaea viscosa): This native desert shrub has a similar growth habit to Oleander and can be used as an attractive hedge or privacy screen. Unlike Oleander, there are no colorful flowers. However, Hopseed more than makes up for that thanks to their bright green evergreen foliage that is sure to add vibrant greenery to any yard. They look fantastic and can block unwanted views growing in their natural form or pruning them into a formal hedge. They are very drought tolerant, so they are perfect hedges for any yard in Arizona. Feel free to use this sun-loving shrub as a tall, narrow screen or hedge. Hedges are a welcome part of any landscape all year long. A natural fencing solution can increase property value and is always going to be good for the environment. It’s summertime, enjoy your yard with shade and privacy! 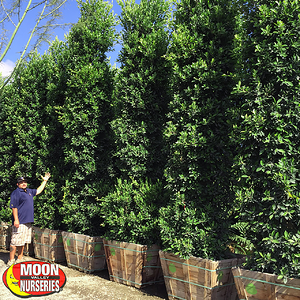 Moon Valley Nurseries has the hedges you need. We do all the work, too! Chinese Elm Trees Create Shade! 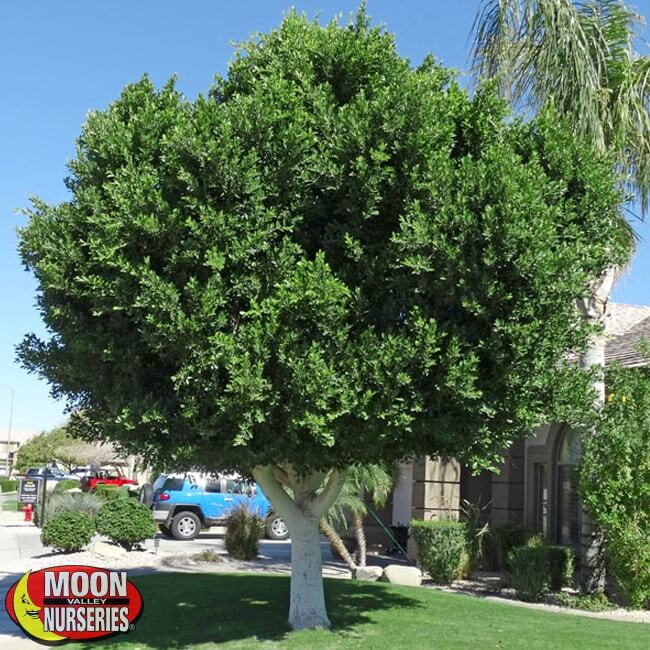 The Chinese Elm is a favorite shade tree in the United States, especially in Arizona. Do we ever get used to the summertime heat? Some people do. The good news for those that never get used to the bright sun and heat is that you don’t have to spend all your time indoors. As comfortable as an air-conditioned room can be, we can get a little stir-crazy staying indoors all-day long. Trees can come to the rescue! Plant specimen trees and get ready to breathe some fresh air. 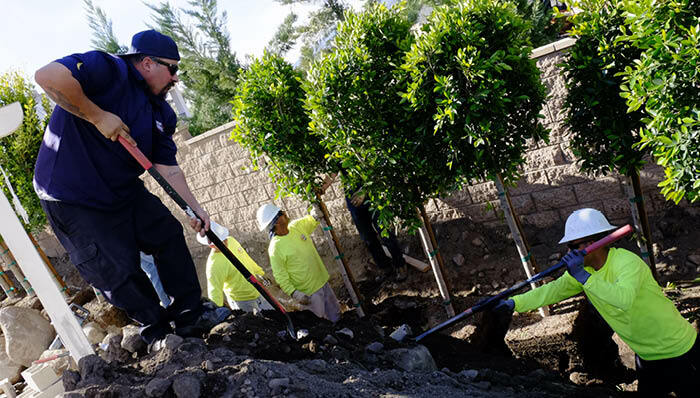 Trees are a valuable and essential part of the desert landscape. They provide a resting spot for those of us that don’t want to be cooped up indoors because of the blistering sunshine. 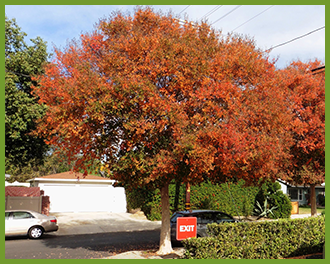 Beautiful shade trees increase property value and add color to our arid environment, too. Can you imagine our native landscape without trees? We sure can’t! 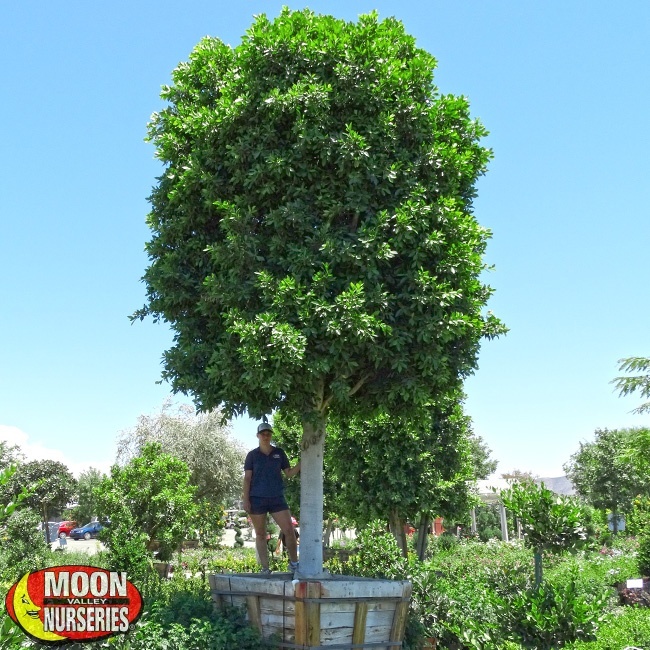 So, if you are looking for a tree that can block the sunlight, look no further than the Chinese Elm tree. There are a couple of different varieties of Chinese Elm available. Varieties include ‘True Green,’ ‘Drake,’ ‘Sempervirens,’ ‘Allee,’ ‘Dynasty,’ and ‘Everclear.’ There are even dwarf varieties that are commonly used for bonsai. In fact, Ulmus parvifolia is one of the most popular bonsai trees. Of these varieties, many homeowners tend to agree that the ‘Tue Green’ and ‘Drake’ Chinese Elm are the most attractive of all. They feature small, deep-green leaves that stay attractive, even in the summer! Don’t let the summer sun keep you from being outside. After all, it’s the summer and the days are longer! Fire up the barbecue, start a game of horseshoes, or just lounge by the pool or patio. 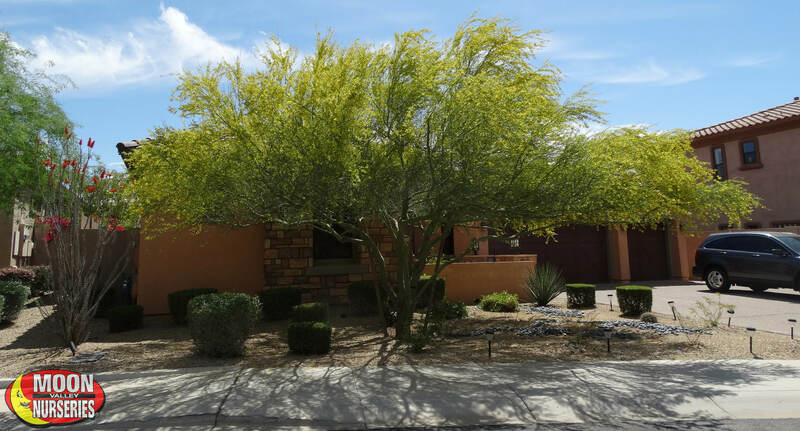 Plant this shade tree in your landscape and feel free to enjoy your view, and our majestic desert scenery no matter how sunny it gets outside. Here’s why. 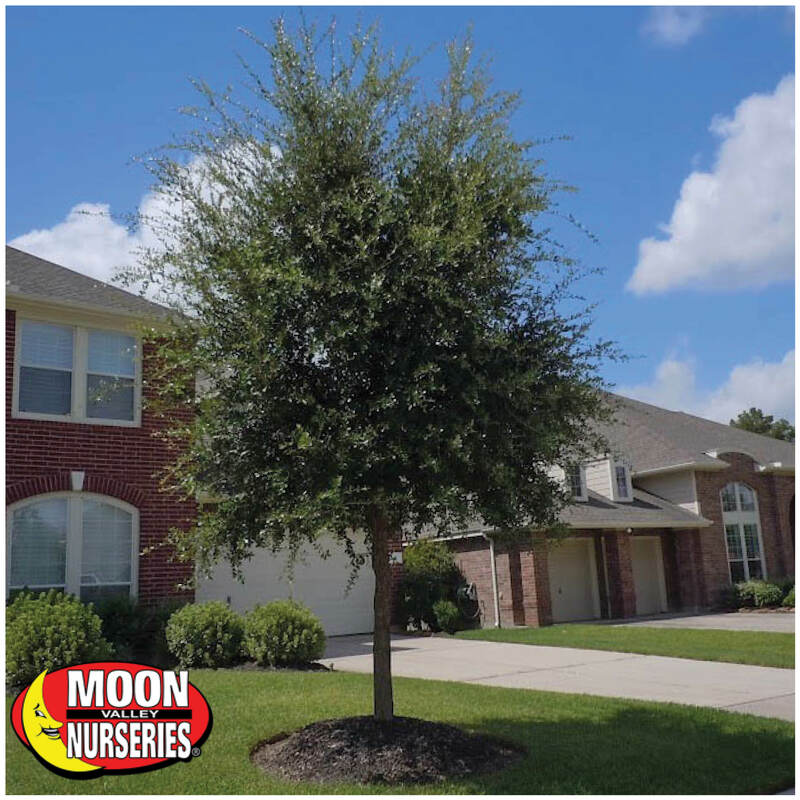 Chinese Elm, botanical name Ulmus parvifolia, grows fast, so you will not be waiting too long to enjoy a picturesque and comfortable spot in your yard. In fact, once you have one of these trees in your landscape, you will be glad to know that you can expect to have excellent shade coverage at an early age! Feel free to rest and picnic under its umbrella-shaped canopy – it can spread up to 70-feet wide! Did you know that the Chinese Elm is the only elm species that can tolerate the severity of the low-level elevation of the Arizona desert? 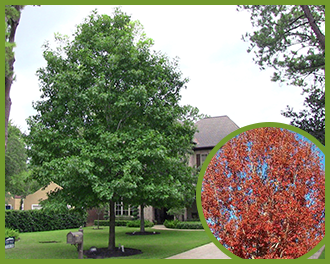 In the United States, and throughout our area, Chinese Elm is often found in yards as a patio tree or sun screen. It can grow up to 60 feet tall, with a vase-like shape and a spreading, weeping branch habit that can create a comfortable spot outdoors, even when the sun is on full-force. Of course, this tree grows fast. However, buying a big specimen tree is your best bet to take advantage of all its incredible characteristics. You see, when appropriately placed around the home, a big specimen can block out the sunlight that hits the house, which can help lower the inside room temperatures! Be sure to speak with one of our design specialists, and we will be glad to show you how! Did you grow up around trees? Remember all those precious memories playing in your yard? 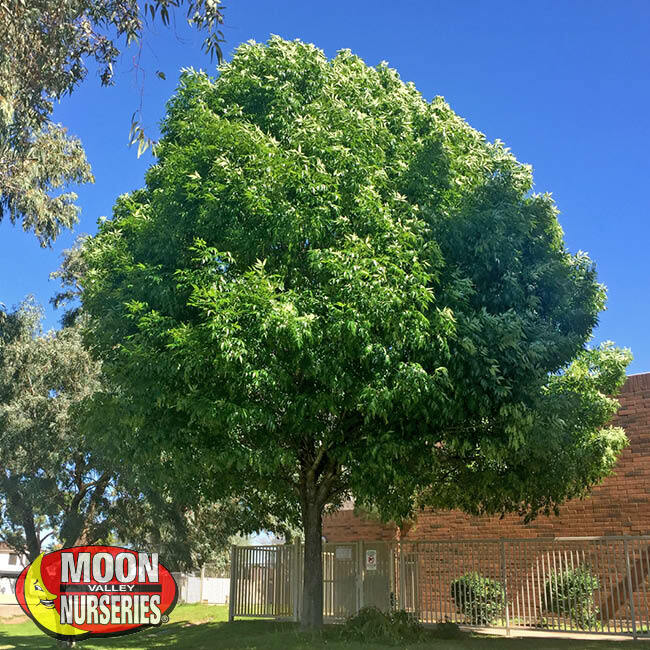 Your parents probably let you stay and play outside longer because they had a Chinese Elm tree in the back, providing lots of shade to protect you from the sun. Big specimen trees are begging for someone to climb and explore their limbs. Do you remember your first crush? This is the type of tree that your kids may want to engrave the initials of their first crush. Keep the memories going, from generation to generation! Let’s talk about the bark of this tree. Besides its beautiful green leaves, the mottled bark is something that gets plenty of notice, too. When the distinctive bark sheds, it resembles camouflage-like patterns that attract both young and old alike. American Elm trees were once highly prized shade trees. Then they fell on hard times. Dutch Elm disease devastated many American Elm trees – millions in North America. Chinese Elms were introduced as a response to this devastation and with fantastic results. These disease-resistant varieties are helping to make a comeback of these classic trees. 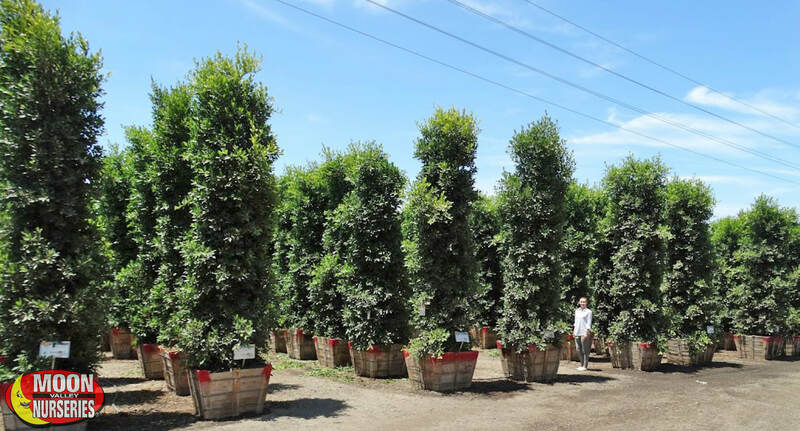 Since being introduced, Ulmus parvifolia elms have thrived in the United States, making homeowners, landscapers, and commercial property owners happy along the way! 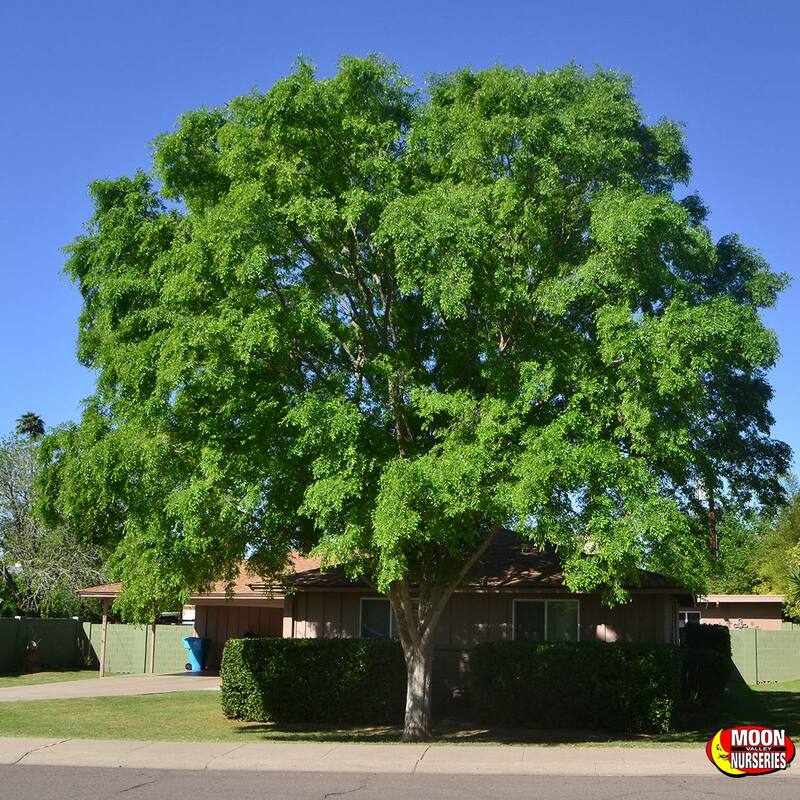 After all, shade trees such as a well-developed Chinese Elm can add curb appeal and help attract home buyers and customers. Plus, who doesn’t want to have a beautiful tree that can block out the blazing sunlight in their property during the summer! Trimming: Even though Chinese Elm has a higher resistance to Dutch Elm disease, it is not immune to it. Always be sure to examine mature trees for signs of diseased or dead branches. If there are diseased or dead plant materials remove them and burn them. Young trees will benefit from selective pruning. Doing this can help the young trees develop correctly and prevent wind damage. Prune young trees early so they can develop good branch structure. Our experts custom-grow them and know how to prune and train this tree. Watering: Once established, it is a drought-tolerant tree. In the summer, it is good to water any young trees weekly. Deep irrigation is the best way to water, especially during our hot and dry summer. Do not let your tree dry out completely. Mulch: Add mulch immediately after planting. Mulch can help the soil retain moisture and can help control weeds. Fertilizer: Ulmus parvifolia is very resistant to pests and diseases. That said, fertilization can help maintain the tree and increase their resistance to injury from disease and insects. 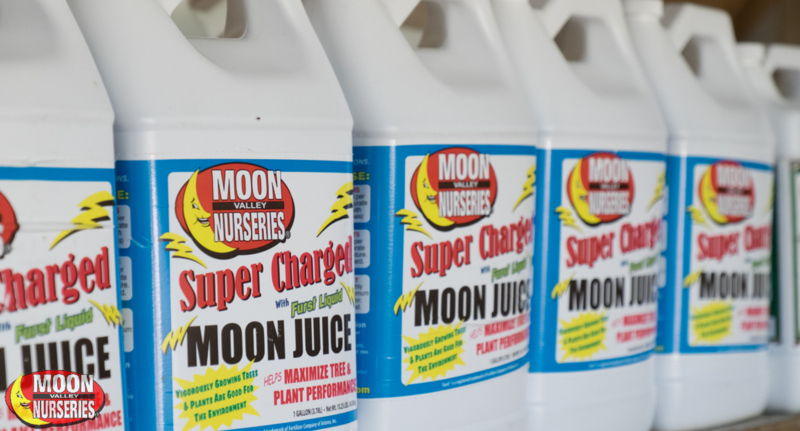 Moon Juice is ideal for maximizing the health of your tree. The Chinese Elm is among the best elm trees for making great shade. They prefer to grow in a location with full sun or partial shade exposure. 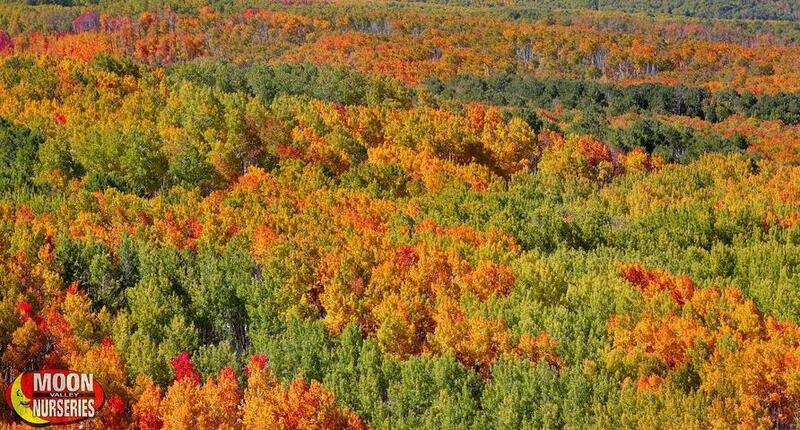 These trees can grow in a wide range of soil conditions and can tolerate cold temperatures once the colder weather arrives. Since they can tolerate urban conditions, they are often planted as street trees in city gardens. This tall and fast-growing tree is an ideal park tree, too! Plant them in your backyard, add a resting bench, and create a park-like setting. Plant one in the front yard to add curb appeal and to cool the hotter parts of your house. These classic trees bring plenty of interest no matter where you have one planted. 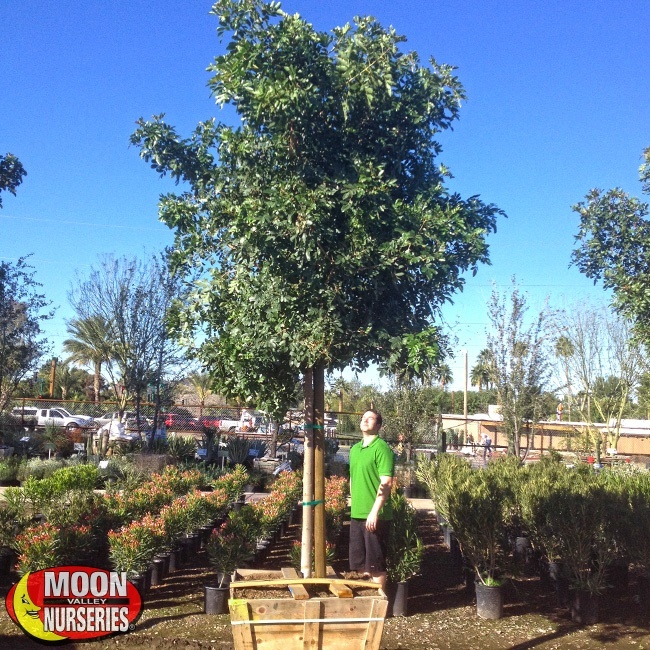 Speak with a Moon Valley Nurseries professional for placement ideas. Our design specialists will be glad to show you the best places to plant one in your landscape. 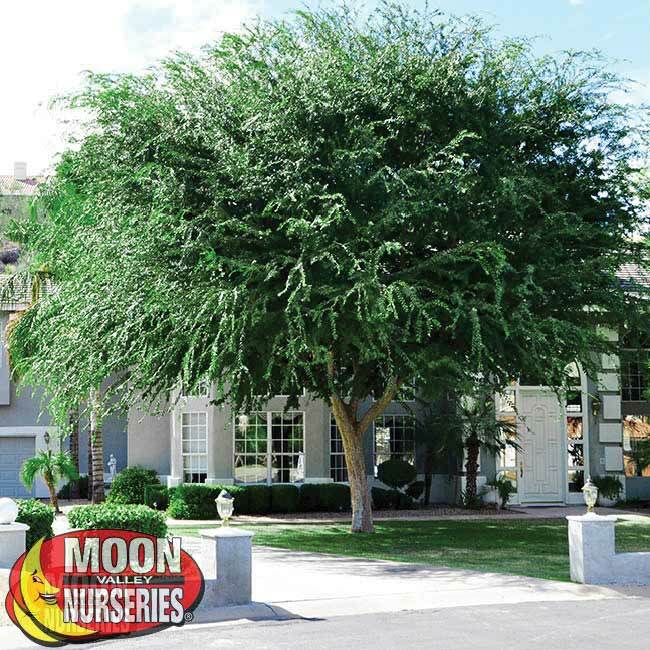 At Moon Valley Nurseries, we always save you money by selling big specimen trees in small boxes. 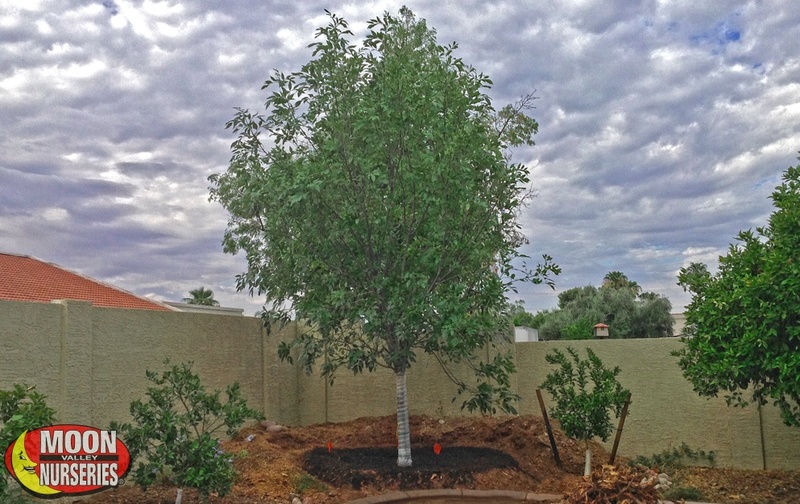 We are proud of custom-growing the best-quality trees with perfect roots so that they will thrive in your landscape. We value engineer our products so that you get the best price on a tree that you cannot find anywhere else. 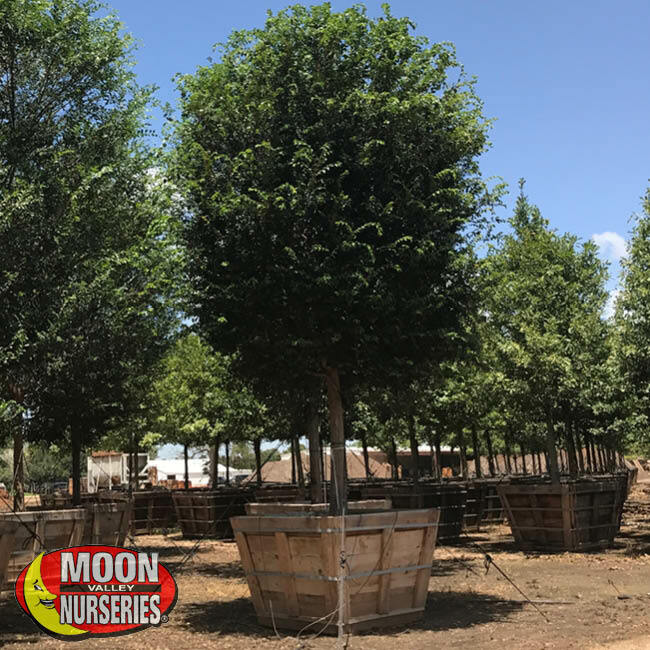 We love Chinese Elm trees and carry two of the best varieties available, ‘True Green’ and ‘Drake.’ Both varieties are going to provide dense summer shade! Drake’s Chinese Elm (Ulmus parvifolia ‘Drake’): This disease-resistant variety features an attractive broad-spreading crown to block the sunlight. Feel free to take in the shiny dark green leaves and the shedding bark no matter how sunny it is outside. Thanks to its ability to block the sunlight, spending time outdoors in the summer can be a much more comfortable experience. This tree is an interesting addition to any landscape. We like to use it as a focal point or as a shade tree for the lawn or patio. 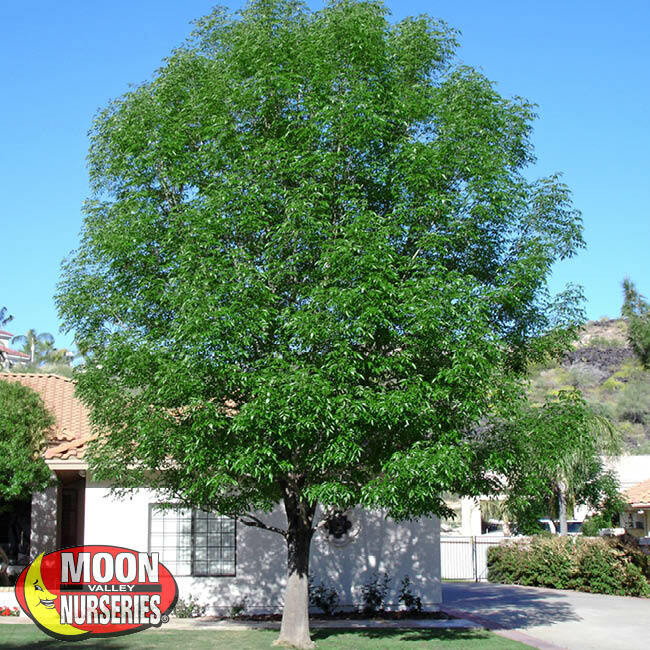 It is an excellent choice for all sizes and types of landscapes in Arizona. 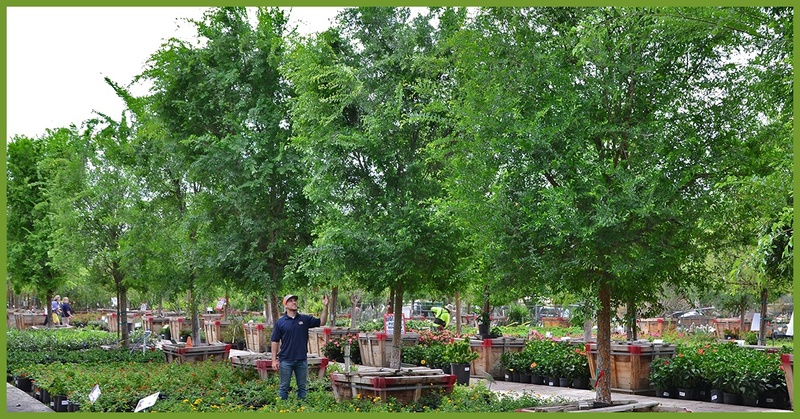 Chinese Elm ‘True Green’ (Ulmus parvifolia ‘True Green’): Relax under the umbrella-shaped canopy! 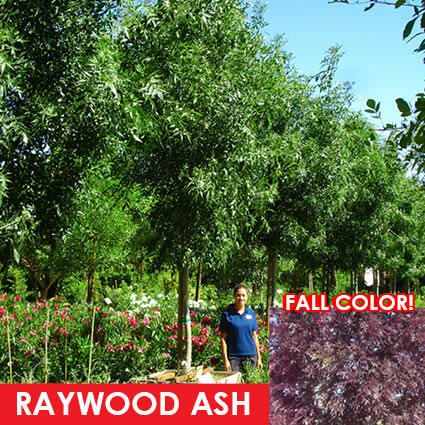 These extremely fast-growing trees are ideal for the play area and any size yard. We love its glossy green foliage and of course, the added attraction of the mottled, peeling bark. This tree is an excellent choice for the desert. They require less maintenance and clean up than many other trees. As impressive as this tree is in the summer, it puts on a show in the fall as the green foliage turns to a bright yellow color. Plant more trees! Classic trees such as the Chinese Elm are good for the environment and can make people feel good, too! Do not let the sun keep you from enjoying your yard. We believe that Ulmus parvifolia is one of the best sustainable landscape trees for making shade. Plant these iconic trees in your yard and enjoy your summer! 15-Month Warranty – Trees Make Life Better! Moon Valley Nurseries is proud to offer the best warranty in the industry! Our incredible 15-month warranty is an excellent value for our customers. That’s right, with our industry leading 15-month extended warranty, you can feel more confident than ever purchasing the best trees on earth. This 15-month warranty is only available for a limited time, so act fast and rest assured that the best trees on earth will increase property value and make your life better! You know what else makes this warranty so amazing? We will replace the tree during the 15-month period, no questions asked! No other nursery does what we do! Our warranty includes free double staking. Double staking is important because it supports the growth of the new tree and is recommended for high traffic and high wind areas. What Comes with an Extended Warranty? You might be asking yourself why this extended warranty is worth it. Well, first off, it includes free double staking if necessary, which is an up to $50 value! It also includes a 15-month warranty from the date of planting. Guess what else it includes? There is no charge for a return delivery/installation when the warranty is redeemed. When Can the Warranty Be Purchased? You will want to purchase the extended 15-month warranty before the installation date. Our nursery professionals will be glad to go over all the details. Visit your nearest nursery location and ask us about this limited extended warranty. 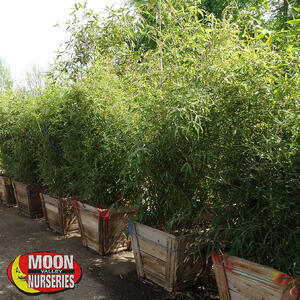 Buying trees from Moon Valley Nurseries is always going to be a great value. We value engineer all our trees so that you get the best quality tree at the best price. 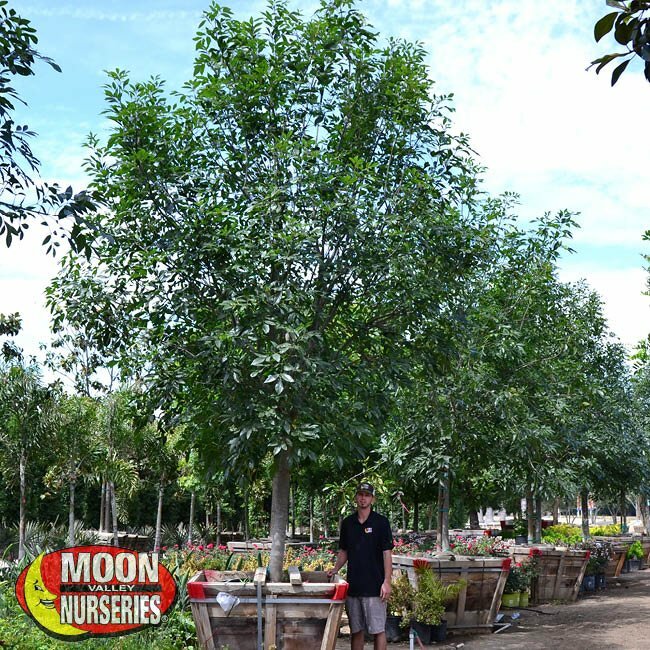 Visit us today and select the perfect trees for the perfect spot in your yard. Be sure to purchase our incredible 15-month warranty and let us do all the work! Learn How to Prune Deciduous Trees Like an Expert! Prune deciduous trees in the winter because the weather is perfect for working outside and since the leaves have fallen and the branching structure is unclothed, it’s easier on both you and the tree! You will also want to prune apples, peaches, nectarines, apricots, and nuts in a way so that the height of the fruit-bearing branches is not too high, this way, come harvest time, picking the fruit is a breeze! 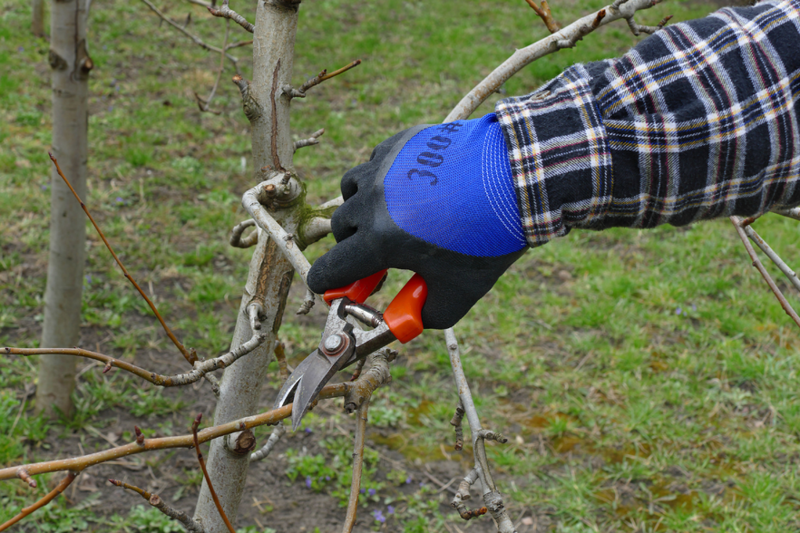 To prune deciduous trees, you’ll need to have the right tools on hand, as well as knowing what to prune. The goal is to remove diseased branches and also to remove those branches that are rubbing together or look like they might in the future. You’ll want to begin a visual inspection starting at the top of the tree and working downward. Never remove more than ¼ of a tree’s crown in a season. For most deciduous trees, avoid pruning up from the bottom any more than ⅓ of the tree’s total height. Keep your tools sharp! We find that one-hand pruning shears with curved blades tend to work best on young trees. 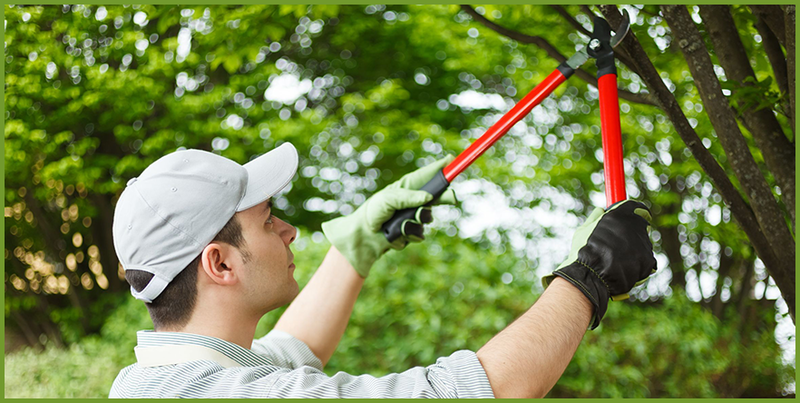 For higher branches, use a pole pruner. For a major job on a bigger tree, we recommend professional tree service. There are two types of cuts – heating and thinning. You will want to cut far below the diseased areas and to avoid splitting, make a thinning cut to remove one branch. It’s always a good idea to trim suckers and water spouts because they can interfere with the normal growth pattern. Heading cuts can be made to reduce the height of the tree. You’ll want to do this may cutting lateral branches back and remove terminal buds. Heading cuts will stimulate growth close to the cute. You’ll want to be sure to not use these cuts on branches that are older than one year old because doing this can lead to suckers and water sprouts. Of note: heating or topping can also disfigure older trees and may expose large areas of bare wood to insects and diseases. Thinning cuts basically means cutting the branch where it is attached. Also, if you prune a branch back to another branch or cut a branch from the trunk, you are also thinning. The advantages of thinning include better air circulation and it makes it easier for the sun to pierce through, which can let the warmth of the sun into your landscape. 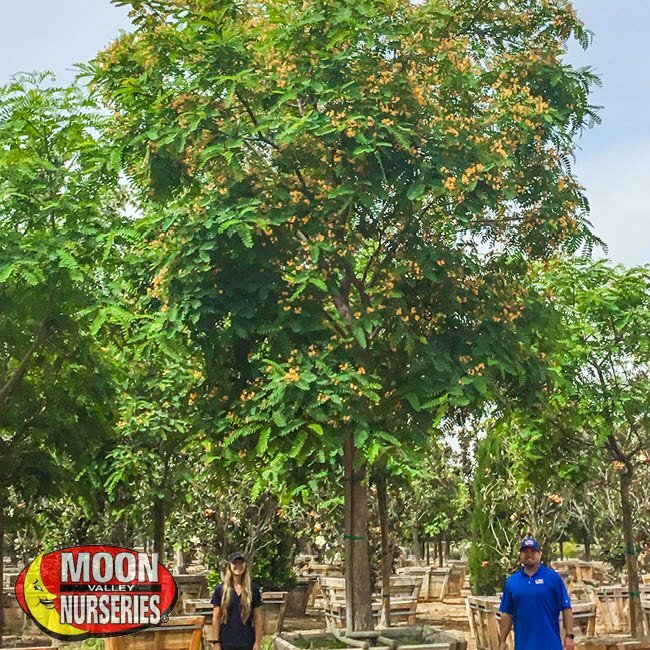 Feel free to contact your local Moon Valley Nurseries expert who will be glad to answer any more questions you might have on how to prune deciduous trees! We are here to help!